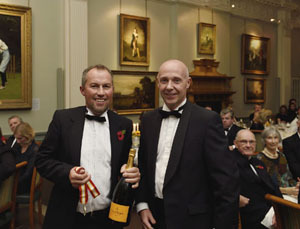 Following a sparkling reception, courtesy of Veuve Clicquot, a record attendance enjoyed the traditional Walter Lawrence Trophy presentation dinner in the Long Room at Lord’s on November 3. 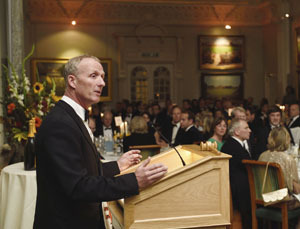 Hosting the evening, former Kent captain Matthew Fleming oversaw the proceedings with a deft touch, providing everyone with a witty early reminder of his Trophy-winning innings against the Sri Lankans in 2002. The 2015 Walter Lawrence Trophy, awarded for the fastest hundred of the season, was won by David Willey, who had thumped a breathtaking 40-ball hundred for Northamptonshire Steelbacks against Sussex Sharks in the NatWest t20 Blast quarter-final at Hove on August 12. Willey, whose century included 10 sixes and 7 fours, joins Yorkshire next season and will play for Perth Scorchers in Australia’s Big Bash in December. Sadly, the 25-year-old all-rounder was not present to receive his award as he was in the UAE with the England team preparing for the One-Day International and T20 International series against Pakistan. 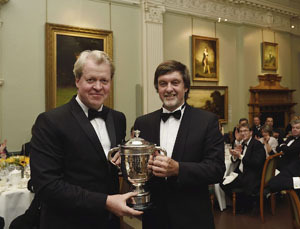 However, his father Peter, the former England all-rounder and first-class umpire, was on hand to collect the Trophy and a cheque for £3,000, from Northants’ Patron, Lord Spencer, on his son’s behalf. Now in its 81st year, the Walter Lawrence Trophy is open to all domestic county competitions as well as One-Day Internationals, Twenty20 Internationals and Test Matches in England. Lilly Reynolds of Essex Women picked this year’s Walter Lawrence Women’s Award with a thundering innings of 170 scored off 154 balls. The 20-year-old right-handed opening bat, hit 27 fours in her innings, paving the way for a 68-run victory against Worcestershire Women in the Royal London Women’s One-Day Cup, Division 2 match at Garon Park, Southend-on-Sea on July 19. Lilly, who also bowls left-arm fast-medium pace, started her cricketing career in Suffolk at Mildenhall Cricket Club, eventually playing for the Suffolk Boys County team at Under-11 before moving to Cambridgeshire to start girls youth cricket. While there she was selected to have a trial for the England U.19 development programme, which she was a part of up until last year, representing an England U.19 team in a tournament in Dubai. She first moved to Essex on loan three years ago but after two years was fully integrated, so this was her first full season. Born in Bury St Edmunds, she is studying for an M.Sc in biochemistry at the University of Birmingham, where she has been a sports scholar for the past two years, but is currently on a third year placement at GlaxoSmithKline in Stevenage, working in Research and Development. 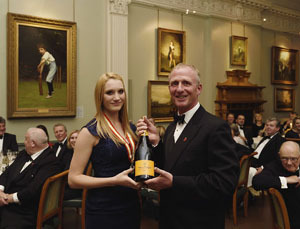 Lilly is the fourth winner of the Walter Lawrence Women’s Award since it was introduced and was presented with a special silver medallion, a cheque for £500 and a magnum of Veuve Clicquot from Matthew Fleming. The Walter Lawrence MCC Universities Award for 2015 was won by Oxford’s Lloyd Sabin for his score of 216. His prodigious innings, the highest against one of the other five MCCUs or against one of the first-class counties, was achieved against Cambridge MCCU at Fenner’s on May 12 off 258 balls and featured 23 fours and 7 sixes. 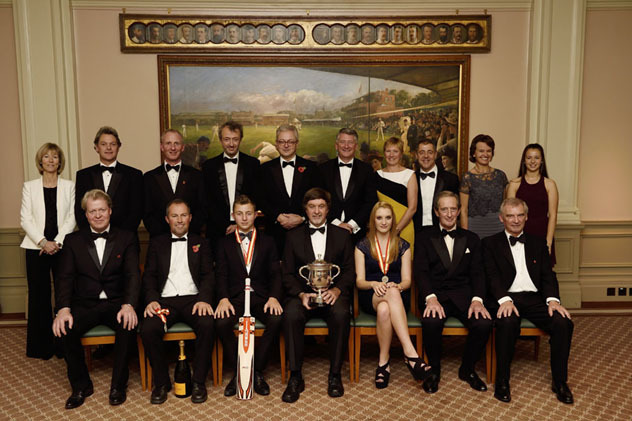 Sabin, who started playing for Banbury CC at the age of 6, became a member of the Middlesex Academy before going to Oxford Brookes University from where he has just graduated with a degree in sports coaching and physical education. He has also played for Oxfordshire Minor Counties (2010-14) and Middlesex 2nd XI. Lloyd, the second Oxford winner since the award’s inception in 2006, is currently in New Zealand so the special silver medallion and cheque for £500 were accepted by his father, Andrew, on his behalf. Oscar Gutierrez of Leighton Park School, Reading, is the winner of this year’s Walter Lawrence Schools Award for his innings of 134, the highest score by a school batsman against MCC. Skippering the school on June 17, and facing an MCC total of 254 for 2 declared, Oscar hammered a typical whirlwind knock of 134, which included 19 fours and 4 sixes off 98 balls, enabling his team to earn a battling draw and finish on 206 for 9. The 17-year-old is a highly-gifted sporting all-rounder who, in addition to his dashing cricketing prowess, plays fly-half for Henley Hawks rugby colts, is the school cross-country champion as well as representing Reading Schools, and is expected to captain the school football team next term. 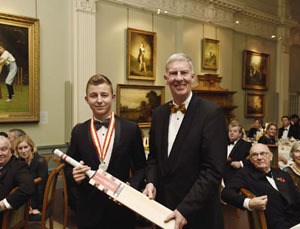 Oscar, the fifth winner of the Schools Award, was presented with a special medallion and a Gray-Nicolls cricket bat by MCC President Roger Knight. 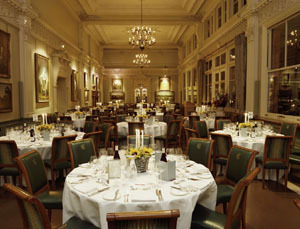 The celebratory dinner had begun with the sad news of the death of one of England’s greatest batsmen, Tom Graveney, at the age of 88 , who was a winner of the Walter Lawrence Trophy in 1968, but it ended on a veritable high with an effervescent after-dinner speech by Ian Lovett, the Deputy Chairman of the ECB and Chairman of Middlesex CCC.